American James Blake during first round match against Lukas Lacko of Slovakia on Day One of the 2012 US Open at USTA Billie Jean King National Tennis Center. 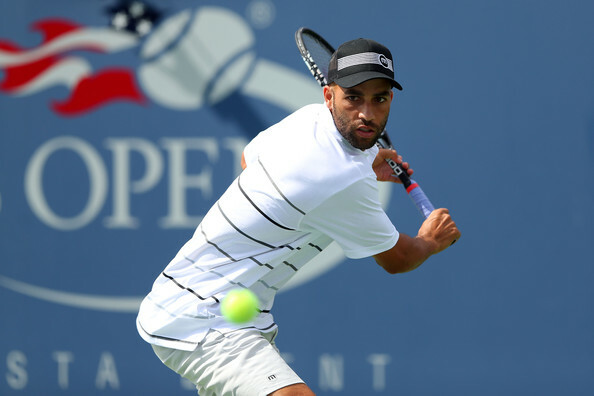 Native New Yorker and hometown favorite James Blake, now 32 and playing in his 12th US Open, and a new dad as of June, toughed out a lengthy, momentum-killing rain delay and defeated Lukas Lacko of Slovakia 7-5, 6-2, 3-6, 6-3 in the first round in Louis Armstrong Stadium Monday. After coming out a bit flat to start the first set, Blake and Lacko traded a slew of unforced errors. As the stands began to fill up with late-arriving supporters, Blake slowly found his rhythm. The 24-year-old Lacko – who hasn’t won a match since losing to Jo-Wilfried Tsonga in the third round at Wimbledon – continued to struggle. In the first set, after serving his first perfect game of the match to tie the score at 5-5 and breaking Lacko with a cross-court Hail Mary return that just grazed the line, Blake grabbed a 6-5 lead. He served out the set 7-5 with a perfectly placed ace clocking in at 125 mph. Blake cruised in the second set with the crowd behind him. The American capitalized on an early break of Lacko, and he built an insurmountable lead, finishing the set in 28 minutes. That momentum vanished after a two-hour rain delay. The veteran Blake appeared stiff when he returned to the court, and he allowed Lacko back into the match, giving up his serve and essentially handing the Slovak the third set. After trading early breaks in the fourth, Blake survived the brief scare, finally claiming the win on his fourth match point, as he confidently stepped around a backhand and crunched a forehand down the line.